Scariest moment: Onboard a freighter loaded with sugar, tons of humongous ants attack the crew in a full-scale massacre. Weakness: Flamethrowers. Or possibly gigantic magnifying glasses. Hell hath no fury like an ant given gargantuan size. 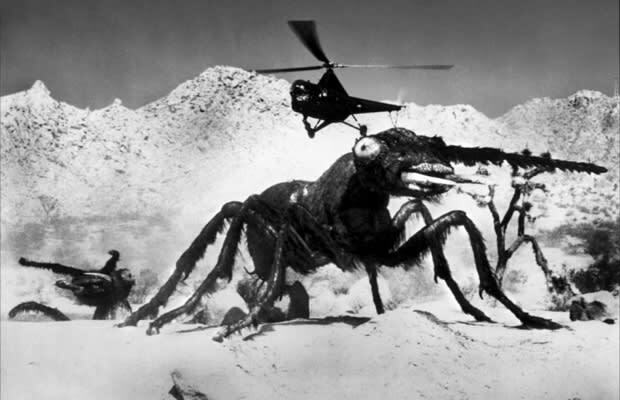 In the 1954 flick Them!, atomic tests in New Mexico go awry, causing those little black insects everyone casually crushes on sidewalks to mutate into murderers the size of monster trucks. And it's not as if ants don't have a reason to hate humans—when was the last time you stopped to let an ant pass you by, rather than step on it and go about your day without remorse? Exactly.